Côte d'Opale » Download the app’ Marinas Plaisance Côte d’Opale ! 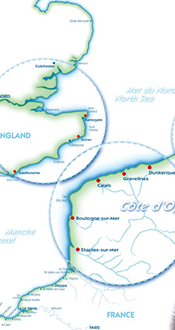 Dunkerque, Gravelines, CALAIS, Boulogne sur Mer and etaples sur Mer at your fingertips. Make the most of your time in the North of France. Restaurants and French specialities places of interest,beautiful landscapes , walks and monuments, your visit is planned on an hour basis or more. Just choose your itinary from the marina office and enjoy walking or cycling through the town. Each result comes complete with a Google Map location. Marinas plaisance cote d’opale can be downloaded freely as an App for Apple phones and for Android phones.